Future triffid in the garden? I got my hot water heater replaced with a solar boosted unit 7 years ago when the old one died. The tank includes an overflow pipe, out of which small amounts of water sometimes drop. Because it’s only a small amount of water, I made no special arrangements for it. It drops straight onto part of the side footpath and (theoretically at least) drains away. After a little while, I noticed some moss had started to grow on that section of footpath. Fast-forward to 2015, and the moss has grown and been joined by who knows what from who knows where… it’s now a proper little garden — probably of horrible weeds, but still. I could cut it all back, but I’m intrigued to see how much it grows from here. If my blog goes silent, you’ll know it really was a triffid. Me thinks your imagination is going as wild as your garden! I guess you know that the water that drips out is from the pressure release valve? As cold water heats up, it expands, so this valve is to allow a bit of water to escape. I’ve been told that it’s a good idea to operate the valve manually every few months to give it a bit of a workout and help keep it in good order. Is the pink flower a begonia? Kind of looks like one. Looks like a lovely little ecosystem ! 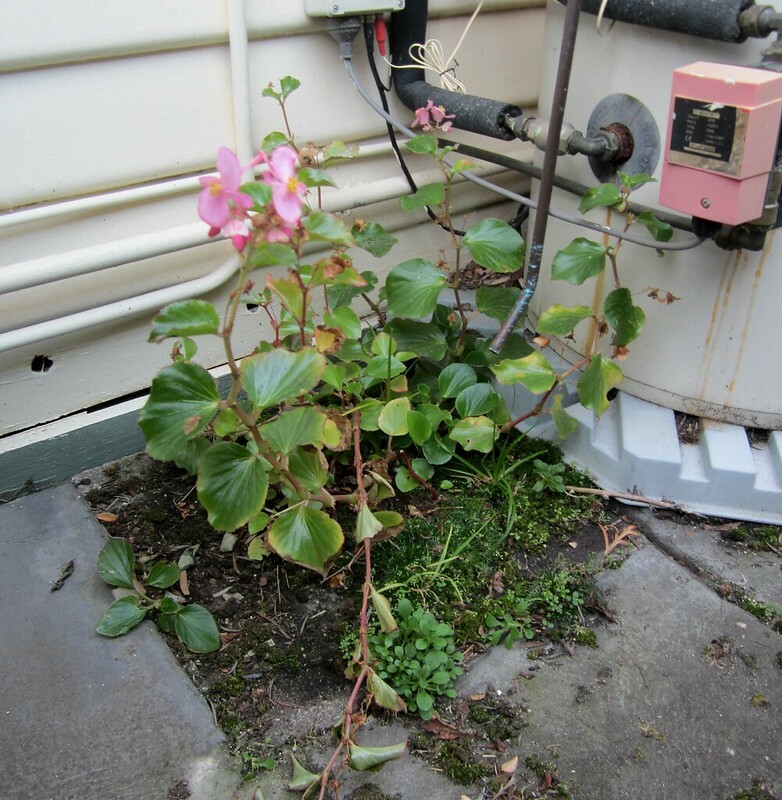 It’s a Begonia…aren’t you lucky!